Are sexist men less evolved? Meet biologist Michael Kasumovic. He studies evolution in various contexts. Like online. 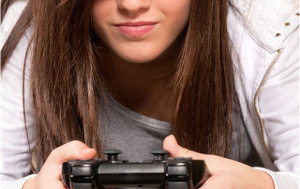 For example, when male gamers, hiding behind Internet anonymity, harass female gamers. Kasumovic’s team participated anonymously in the multiplayer shoot-em-up game, Halo-Three. The researchers chose it because avatars wear virtual armor, which masks gender. Players communicate via microphones. Kasumovic’s team pre-recorded comments to play back. They taped both male and female voices making neutral comments like, “Nice shot!” And: “Good game, everyone.” Then they played the game, sometimes commenting to opponents using the male voice, sometimes using the female voice. What happened? Male players were always cordial to the male voice. And high-scoring males were cordial to the female. But low-scoring males? They made nasty comments to the female voice. In other words: Sexism came from the losers. The evolutionary explanation for this? Low-status males, afraid of losing face with other males, bully females. Maybe those guys should just chill out online and watch cute cat videos. Works for us!